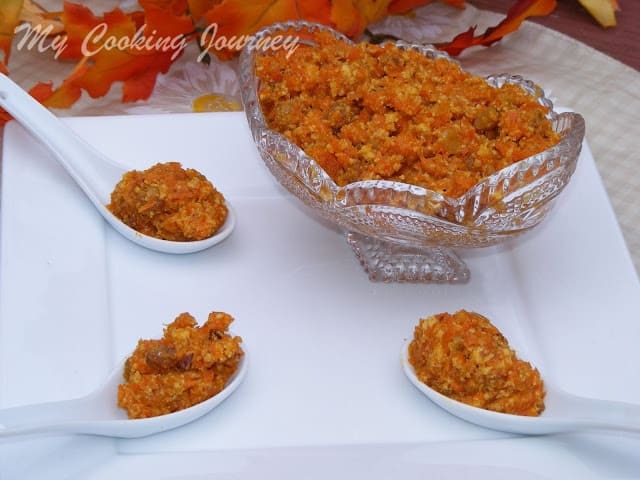 For the third day of Blogging marathon with the theme ‘Pick one and make three’, I chose to make a very famous Indian desert Gajar ka halwa/Carrot halwa. 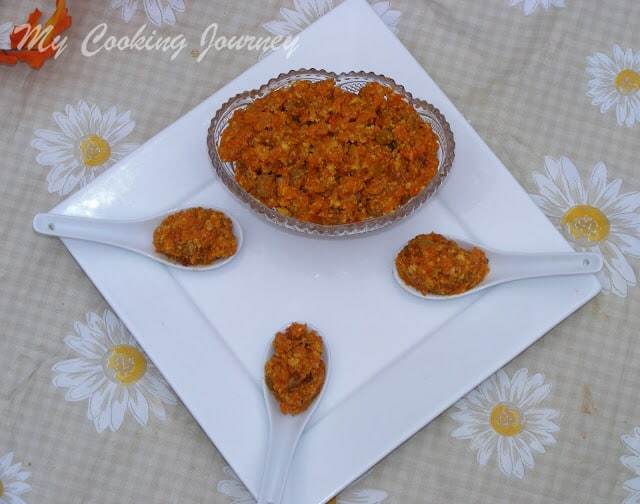 Growing up in North India, Carrot halwa is one of the deserts that is very close to my heart. 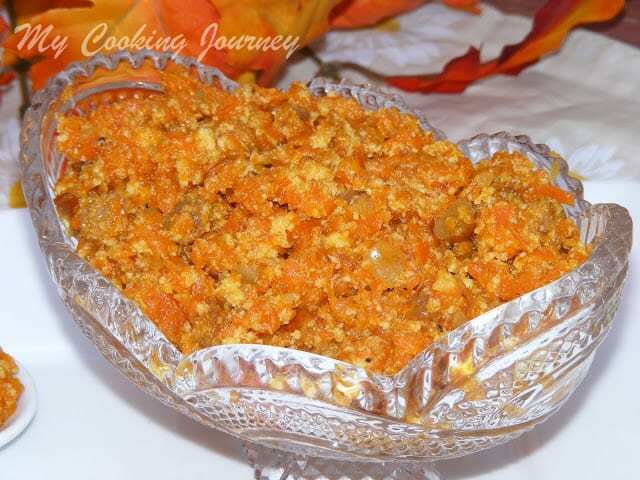 I remember my mother making this halwa with the vibrant red color carrots that are available during winter. 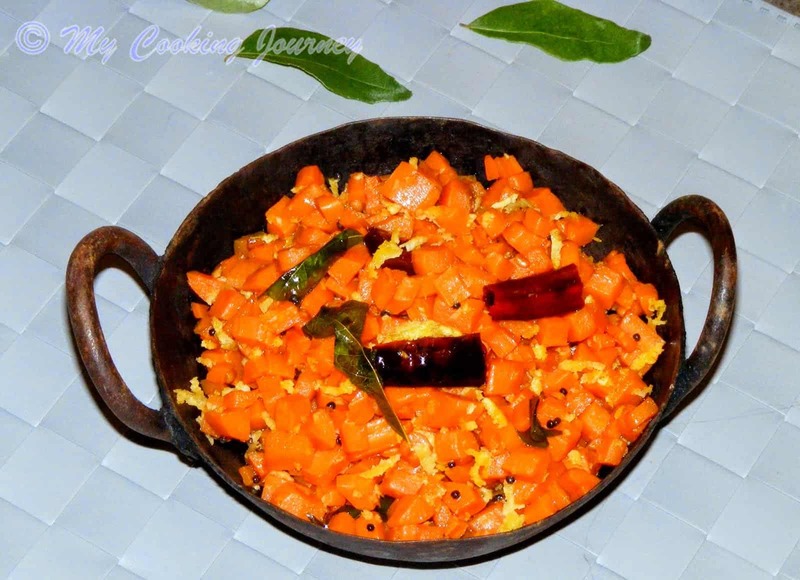 After moving to Southern India we did not find this carrot too often and my mother used to make it with the regular orange colored carrots. 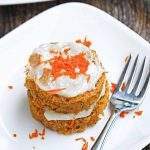 Although the taste is not compromised by using either of the carrots, the color does make the dish more appealing to the eyes. 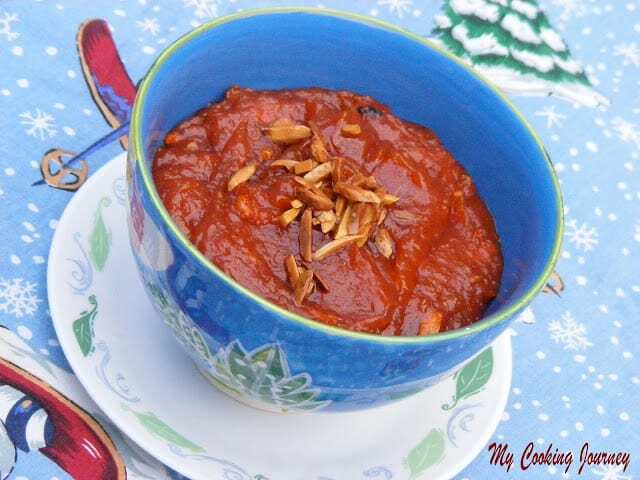 I made this with the regular orange carrot, but the only new thing that I learned when making it was learning to make the khoya from the ricotta cheese. 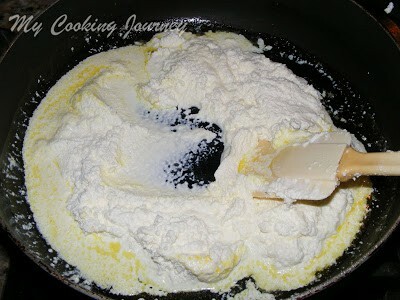 I am not a big fan of ricotta and always stayed away from this. 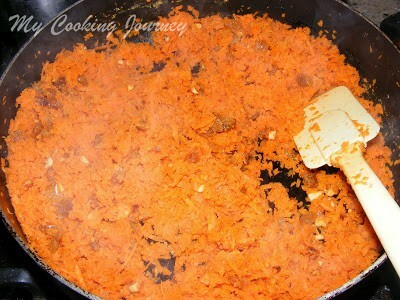 Recently I came across a you tube video of authentic carrot halwa recipe by a person called Balwinder Singh. His recipe was very inviting and I wanted to try it right away. The only thing standing between me and halwa was the fact that he made the khoya with ricotta. I finally decided that I am going to try his exact same recipe and it worked GREAT! The halwa tasted delicious and I was carried to my home land. 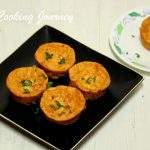 So here I am sharing this recipe with you all. Clean the carrots and peel them. 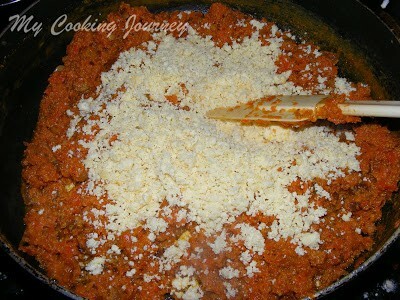 Grate them using a grater or preferably a food processor. 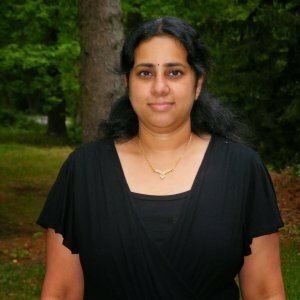 It is a pretty time consuming process to grate by hand, so a food processor would help. If you do not own a food processor, do get your husband to do the work for you. 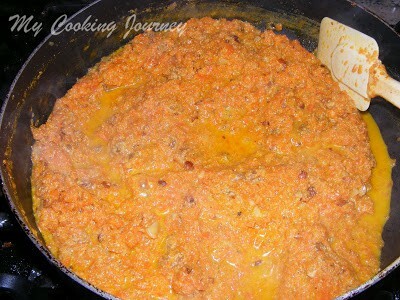 To make the Khoya – In a large heavy bottom pan, heat 1 tbsp of the butter. Let it melt and then add the ricotta cheese. 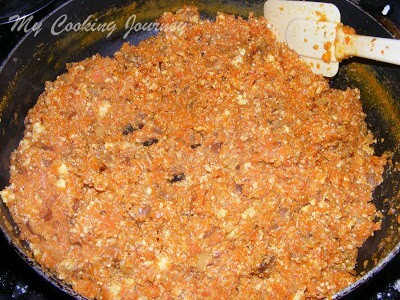 Mix it well and then keep cooking it over medium low flame until crumbly and light brown in color (about 20 mins). Remove it and keep it aside until needed. 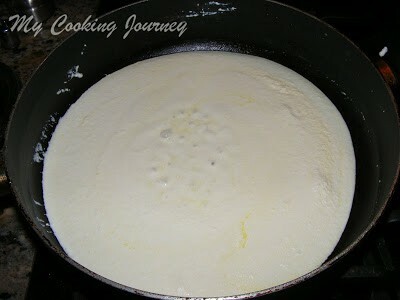 In the same pan, heat 3 tbsp of butter. 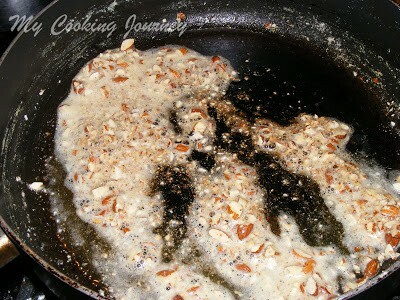 Let it melt and then add the chopped nut. Fry the nuts until golden brown. 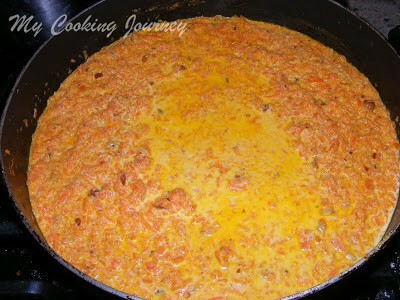 Now add the grated carrots and sauté over medium low flame. 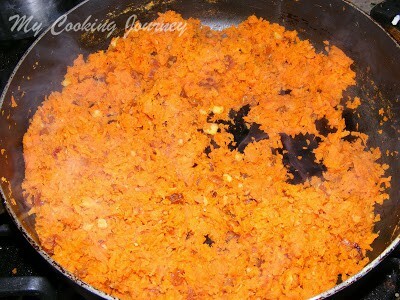 Also add the raisins and the cook them for about 15 mins or until the carrots are aromatic and soft. Now add the milk and mix well. 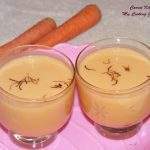 Cook the carrots in the milk for about an hour in low flame. 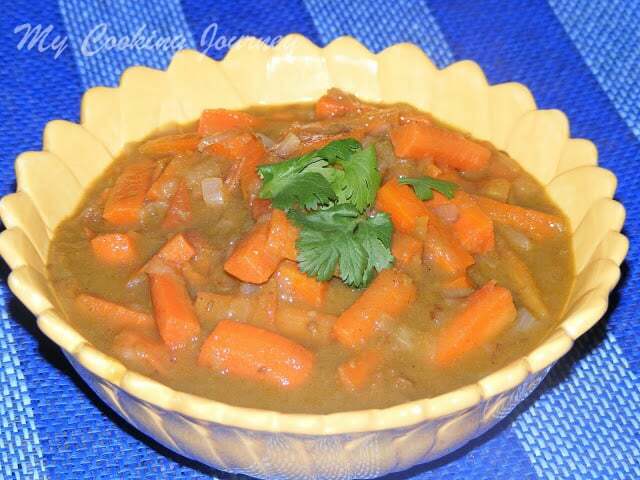 Cook it until the carrots are cooked and about 90% of the milk is evaporated. Add the sugar and mix well. The carrot would liquefy once we add the sugar. Cook it down further for about 15-20 mins until the desired consistency in reached. 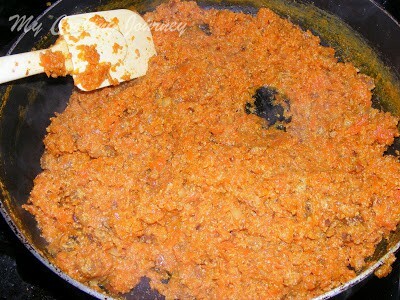 Now add the crumbled khoya and mix it well. Turn off the flame and serve warm or at room temperature. 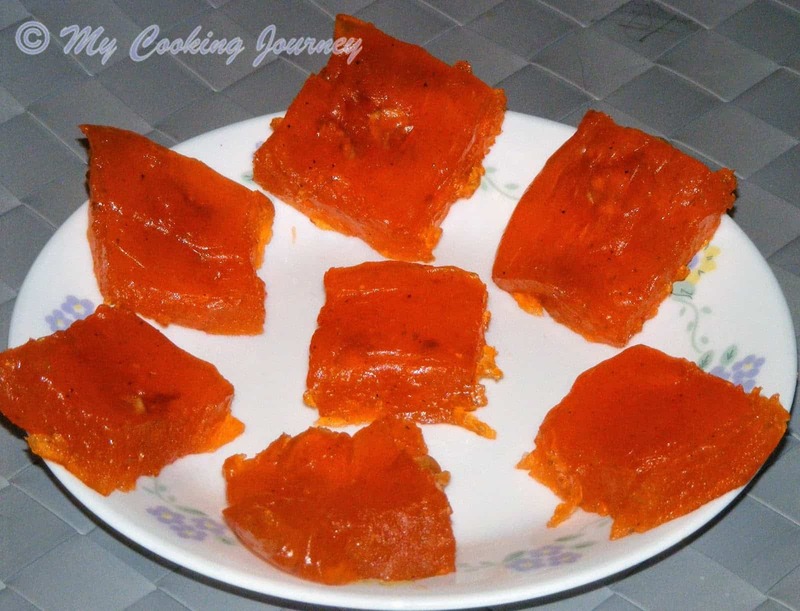 Refrigerate the halwa for up to a week. Reheat it and serve warm. 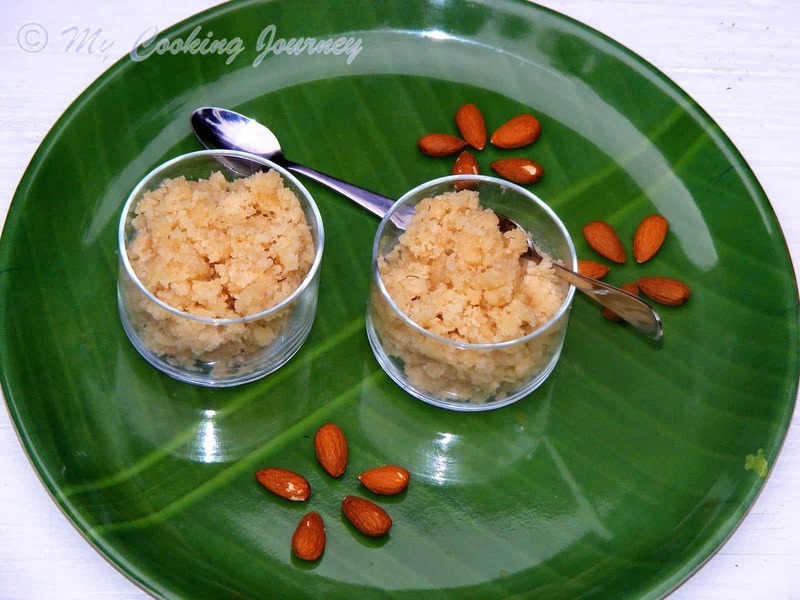 The halwa freezes very well for up to a month. Make once and freeze for later use. thaw it and then reheat it microwave before serving. I knew this is coming and was waiting for it!! delicious pictures!!! I should say your pictures have improved so much and am loving these droolworthy pictures!!! 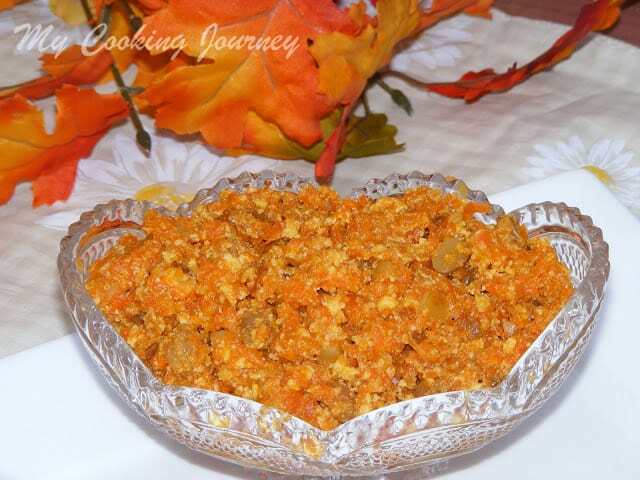 Sandhya, I have tasted the ricotta cheese khoya , on my trip to US…it surely does wonders to the dish..well even I make orange carrot halwa..in emergency..turns out pretty good.your halwa looks good n inviting. Nice use of the cheese there! 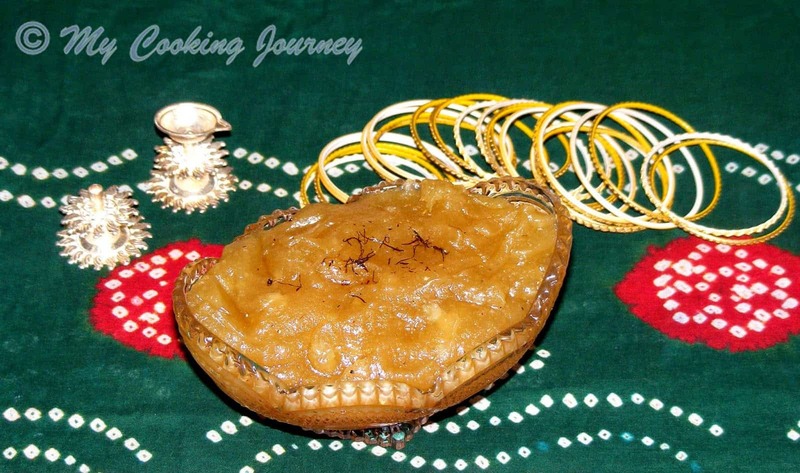 The halwa looks yummy! 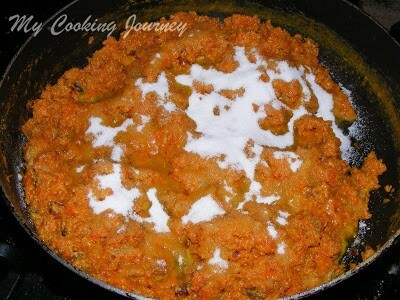 using ricotta to cook gajar halwa. wonderful fusion!!! it is our family favorite looks super delicious!!! 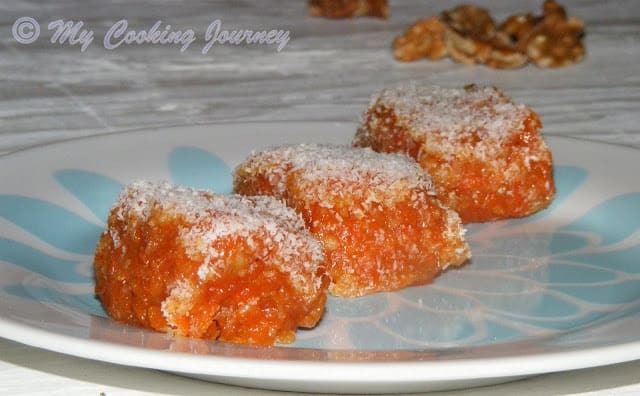 Yummy halwa & great pics! This is very very well cooked. I have seen mom slave for hours to make this prefect. Your recipe looks a little simple 🙂 Noted. I'm drooling here just looking at the pics. 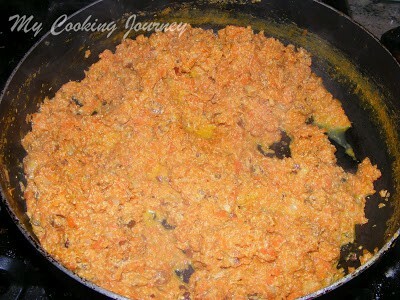 Gajar halwa is time consuming to make, but at the end it's well worth the effort.. yumm!! 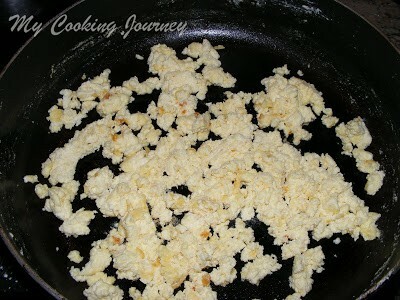 Awesome idea of making khoya with ricotta cheese..shall try it out the next time! 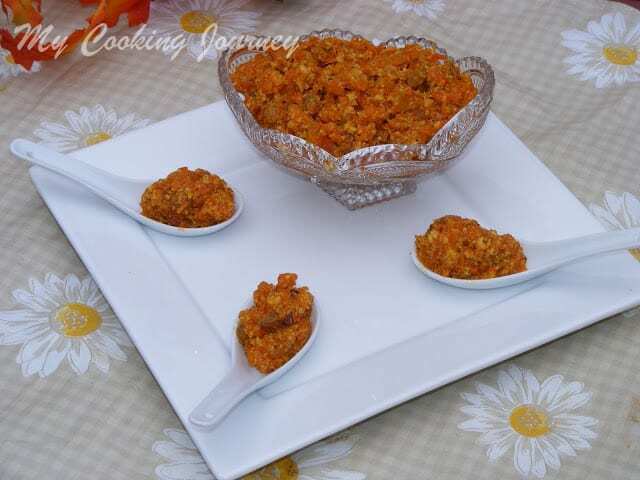 I love carrot halwa and this looks so inviting!! !